Elliott Australia creates jobs with global partnership. Local protective clothing manufacturer, Elliott Australia has just formed a joint venture with Lion Apparel, the world's largest supplier of structural fire garments to fire services. The joint venture brings together the strengths of both organisations combining the global expertise of Lion Apparel with the local manufacturing capabilities of Elliott Australia. 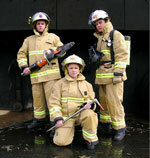 Elliott Australia has kicked off the relationship with a $1 million order to provide fire suits to the South Australian Metropolitan and Country Fire Service. The deal brings back much needed jobs for the Australian clothing industry, as the suits were initially programmed to be made in China.